There is hardly anybody without passion and talent; many talented people want to turn their talent into business but don’t know how.On BizPeople this week, Brojid.com editor, JOSEPH DINWOKE interviews the CEO/Chief Sage at Sagacity Solutions Concepts, OLAYINKA OBANIMI-OYEKANMI, an astute entrepreneur, trainer and consultant shares how he turned his passion into a business and how you can start a business, raise capital and run it profitably. Thanks for joining us on Brojid.com BizPeople. Please let’s get to know you. My name is Olayinka Obanimi-Oyekanmi I work with a company called Sagacity Solutions and Concepts. I have a background in sciences but I am an entrepreneur, trainer and entrepreneurship consultant. I have had the privilege of several informal training through seminars, conferences, books and discussions with experienced business persons and that has equipped me to do what I do. Meanwhile, I have a natural flair, a God-given flair, to teach entrepreneurship principles and business development and management to people. Basically, I am a business man and a business teacher. You own Sagacity solution or just work there? I am the founder and I work there. How old is Sagacity Solutions Concepts? Nine years old. I started in 2007. What motivated you to start Sagacity Solutions Concepts? at Sagacity Solutions Concepts, we give business classes, provide advisory services, negotiations and create links as well as create new opportunities where non-existent to help a client. The concept started long ago before I knew what it’s about. While I was a student, I was very interested in financial information and knowledge. There were several finance based magazines I used to read. After a while, I came down to Enugu. While I was in Enugu I taught entrepreneurship 2 hours every day for about 12 days to corps members. That was how I got into that. Since then I have refined my focus to core business development practice and that is what I do now. 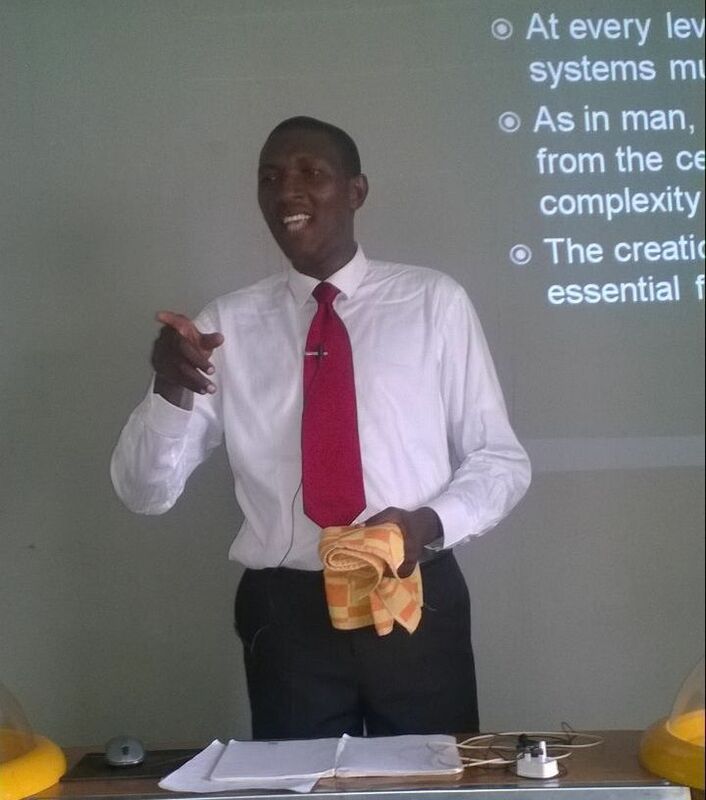 So, how did you make what you teach formal in the form of Sagacity Solutions and Concepts? I used to work in BrainPower Limited and we used to produce BottomLine newsletters. There, I found out that there is a knowledge gap between what people want to know and the information that is available. Many people discussed with me and I found out that they don’t have the technical know-how that will drive them forward in their businesses. What I did was to build a small structure to meet that need. From there we grew from there to where we are today. At what point do you think one should translate one’s skills, passion, talents and knowledge into a business structure like you did. That is the primary response to the demand that is growing and your ability to see the prospect that exists in the environment and industry. At first what I used to do was whatever job I had to do. But over time, there was increasing demand for my services. Setting up a structure is important to enable you serve all the people demanding your service and potentials clients. First of all we help distill your thoughts or whatever business you are trying to set up or the current state of your business. We do that by doing a quick evaluation of your business and present it to you in simple format. We also guide novices and frightened people into the business of entrepreneurship. By the time you put these two things together, you are sure to get positive feedback from whatever business you are doing. If you are sitting before a graduate now, will you encourage the person to take to entrepreneurship or go for white collar job? I won’t give that advice to any person until I have spoken with him/her. There are some people that even if they are supposed to be entrepreneurs, they need to get a job first. I know a man who is a multi millionaire in dollars. Immediately his children, all of them, graduate from college, he ensures that they get a job to understand work ethics and understand how businesses run. That’s one way to look at it. if you want to learn work ethics, there are a few things you can do. You can go for training, read a book or reach out to people that have it in other to get it. For me, I think you have to check your personality and the state in life where you are. If, with your personality and the state in life where you are, you can take up the challenges, and then take it up. Otherwise, just get a job! In a situation where someone can’t get a job to learn work ethics and study work environment are there things he can do to prepare himself for entrepreneurship? Yes you can. There are few things that are fundamental. Work ethics is good but it’s not the only way forward. First you need to understand what you are embarking on. You need to have the right vision and mission and be sure you have passion for the work. However, if you want to learn work ethics, there are a few things you can do. You can go for training, read a book or reach out to people that have it in other to get it. But you cannot say that because you don’t have work ethics, you become reserved or awkward in starting your business. It all depends on your personality and your key personality traits. As an entrepreneur and entrepreneurship consultant, what advice would you give an African youth who wants to start his own business? From my experience, there are two things I will tell the person. It’s actually one but I want to say it in two ways. Number one: Go and learn. How do you learn? There are lots of books available get them and study them. Second: go and learn by, if possible, apprenticeship. Many young person we see today have a measure of imbalance. Their sense of judgment of many of them is disconnected. If you have to survive the hardship of our enterprise economy, you have to learn your business and how to manage it properly. You must be prepared to learn! The learner’s attitude is crucial. Locate a business, collect small pay and learn. Look for another one even if you are not paid, stay there work hard and learn their business processes. Many times, capital is the reason many people give for not starting their own business. How do think an entrepreneur can raise capital for his business? Raising fund for business is not a difficult thing. In fact raising fund for anything is not difficult. It depends largely on trust and track record. What have you done in the past? If everybody knows that one time, you were in school and people gathered school money and gave you and you disbursed it carelessly, you will have difficulty borrowing. You converted it to your personal money and you now want them to lend you money to start a business. They don’t want to give you because they don’t trust you and they have not trusted you since that time. You have to settle down and reach out to members of your family and friends. For you to get that money, you must be a trust worthy person. You must be a prudent and conscientious. The next step is to approach the banks or any other funding firm. How do you manage your human resource is for peak performance? The first thing you have to do for them is to make them see the vision and mission of the company. Second, give them assignments. Third, write down those assignments. Four, supervise them. Those are the four key things you can do to manage your human resource. Please tell me your biggest challenge as an entrepreneur especially in Nigeria. Some of the things I consider to be business challenge are getting good reliable staff. It’s really hard! Another thing is that sometimes, getting funds can be difficult; though not so difficult; another one is the changing system and policies of the government. Infrastructure is another challenge. I mean we still, have to generate our own power. Tell me more about sagacity solutions and concepts. Sagacity Solutions and Concepts is a business developing consultancy. We run through the entire value chain of business development and help our clients to make and implement decisions to drive their process and the entire company forward. So, at Sagacity Solutions Concepts, we give business classes, provide advisory services, negotiations and create links as well as create new opportunities where non-existent to help a client. There is an African youth who is contemplating stating his business. I guess he has the fund but is afraid if the risks associated with entrepreneurship. Please talk to him directly. Starting a business is one of the most exciting things you will probably ever do. If you have decided that this is the path you want to take, get into it. Everything in life has a risk in it. You just have to just start. God will help the works of your hand and help come your way. Meanwhile, keep a date with us next next Thursday on Money Hub as we serve you a super package of business and money insight.